RUGBY LEAGUE: It may have been his last great act for the Maroons. Nate Myles will not be on the field tonight but his legacy lives on in starting props Dylan Napa and Jarrod Wallace. Many criticised the Queensland selectors' decision to bring Myles into camp for game one of the State of Origin series. But it was made with an eye to the future. 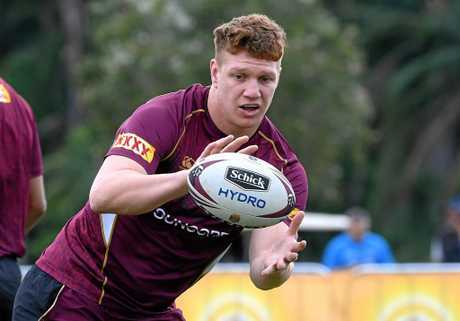 Myles's role in Camp Maroon was as much about bringing a new generation of Maroon forwards up to speed as it was about charging into the fray at Suncorp Stadium. Johnathan Thurston, who will end his own Origin tenure this season, said passing on the knowledge had been Myles's great parting gift. "He's been one of the best forwards that has played for Queensland in the middle," Thurston said of Myles. "So it's great that he's been able to pass on some of that knowledge that he's been able to experience to those younger boys." 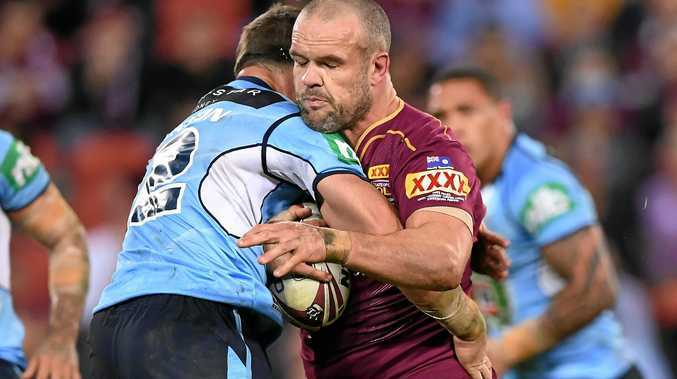 Napa and Wallace will line up against NSW tonight having soaked up as much information as they could from the former Gold Coast Titans captain ahead of the series opener. "That's what I tried to do," Napa said of learning from Myles. "Nate's played 32 Origins so he has a fair idea of how to approach the game and I just tried to take it in and feel relaxed." Wallace will make his Origin debut tonight but he was brought into camp as 18th man for game one and was a sponge around Myles. "I didn't know Nate too well, I'd obviously played against him but when he was here, he just took charge of all the young forwards and helped all the boys out, especially Naps (Napa) because he was starting with him," Wallace said. "It's good to see how much he cared about the young fellas and how much he cares about Origin. "I know that (those dropped ahead of tonight's match) will be disappointed, I know Nate's injured, but they definitely helped out in game one." Despite questions over his form, Myles played an integral part in last year's winning series, with coach Kevin Walters hailing his aggressive defence in the opening 20 minutes. With the old bull gone, Wallace and Napa will play that role, having to withstand the rampages of Andrew Fifita and Aaron Woods as a desperate Queensland bid to keep the series alive. Despite the challenge, the pair are confident they can play their part. "I don't think it's the type of game where you can try and do something single-handedly," Napa said. "We'll be working together as a pack to try and stop what (Fifita) does, he was creating a bit of havoc in that first game. "A few of their tries came from some of his strong runs and offloads so we're well aware of that but we've just got to try and do the job of stopping him." Wallace said he was not worried about the size of the NSW forwards - most of whom are taller and heavier than the Titans front-rower. "Obviously they're a good strong pack and they showed what they can do in game one," Wallace said. "I've played against them before and I'll be looking forward to the challenge of getting out there in the arena and giving it a crack. "They're a good pack, they obviously played some really good footy but the boys will be up for the task here and we're looking forward to the game."